Frances K. Harper is an assistant professor of STEM education at the University of Tennessee, Knoxville. Her research broadly focuses on issues of equity and social justice in mathematics education and mathematics teacher education. 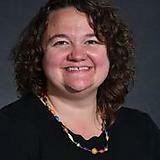 She strives to understand K-12 students’ experiences with equity- minded mathematics teaching. In particular, herwork focuses on how complex instruction, a particular equity-minded approach to collaborative learning, and teaching mathematics for social justice, the integration of mathematics and social justice goals, support girls and students of color to see themselves and to be seen as confident and capable learners and doers of mathematics.